You can read more on each of my books by scrolling down the sidebar on the right of the page. 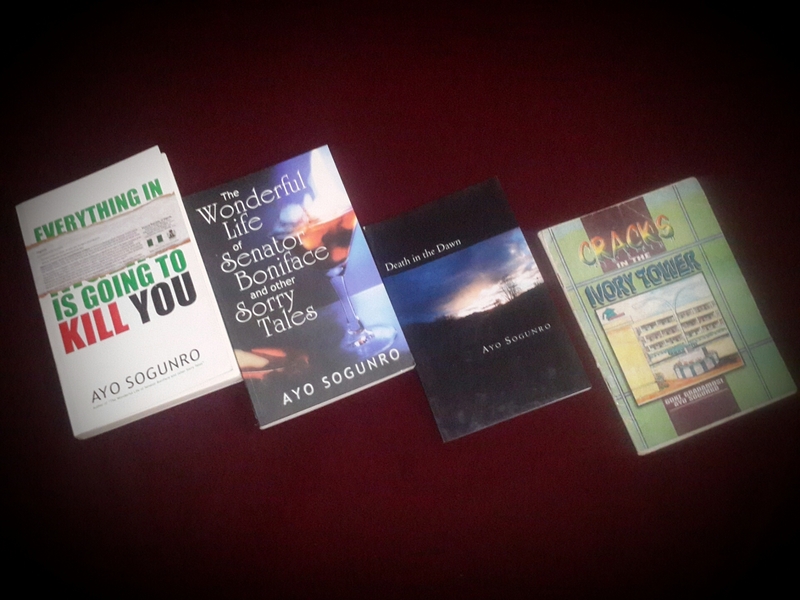 You can then proceed to purchase them offline at fine bookshops in Lagos, Nigeria. Unfortunately, because Nigeria’s book distribution industry isn’t sufficiently developed to accommodate “poor” authors like me, I cannot guarantee that you will find them in bookstores outside Lagos. The Wonderful Life of Senator Boniface and other Sorry Tales: Amazon paperback; Kindle; Okada Books; Adibba (accepts cash on delivery!). Everything in Nigeria is Going to Kill You: Amazon paperback, Amazon Kindle; Okada Books; Adibba (accepts cash on delivery!). Death in the Dawn: Amazon paperback; Amazon Kindle; Okada Books. My earliest book, Crack in the Ivory Towers, co-authored at the age of 19 with my friend Goke Gbadamosi, is out of print—we’ll miss its noble but immature aspirations.